Our last batch of eBay auctions for 2013 just ended! We would like to thank everyone who has made the first year of Lovequist Antiques so enjoyable. We're going to be taking the next couple of weeks off, but look for more great deals via eBay and this website toward the end of January! I LOVE checking our eBay page and seeing new bids! Our latest batch of eBay auctions ends Sunday. Pay by Monday morning and it's guaranteed to arrive by Christmas! See the previous posts for links and pictures! HO HO HO!! HAPPY HOLIDAYS!! We've just lowered the prices on a number of Syroco items on our eBay page, including a great shelf, a set of candle holders, and several other items. All of these new listings will end next Sunday and will ship USPS Priority Mail so that you will get them in plenty of time for Christmas! We have SOLD this 1963 Syroco Gold Shelf! This gorgeous Notturno Intarsio Inlaid wooden clown plaque has SOLD!! Also still available on eBay! We've just reduced the prices on a number of great collectable plates up for auction on our eBay page. They include Norman Rockwell plates and a great set of four plates from "The King And I". A couple of them are pictured below! More good stuff coming soon! 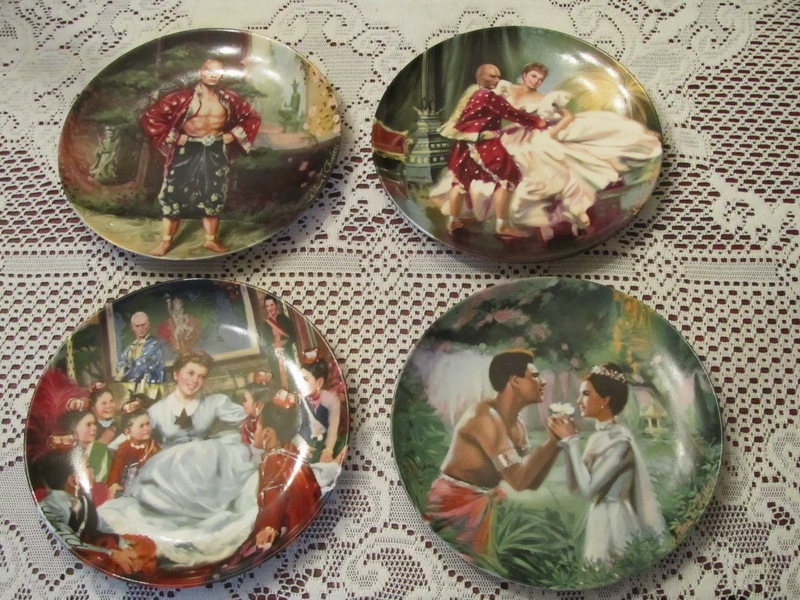 Knowles "The King And I" Set of Four - SOLD! 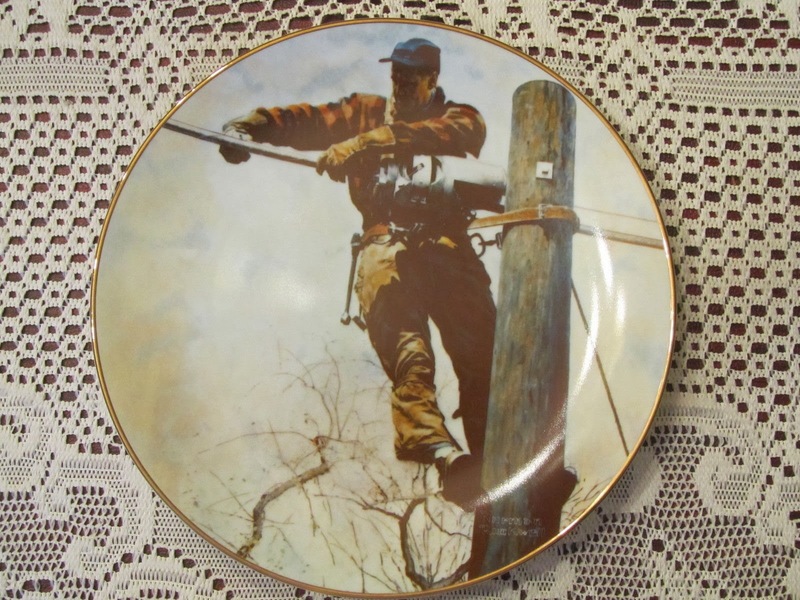 THE TELEPHONE LINEMAN Norman Rockwell Plate HAS SOLD! The Wedgwood Sheffield Hall 1859-1931 Plate has SOLD! Due to the forecast of intermittent sprinkles overnight Saturday and into Sunday morning, we will not be setting up at Todd Farm this week. Check this page soon for our upcoming eBay auctions! FIND US IN HOLLIS THIS SUNDAY!! We WILL be at the Hollis Flea Market THIS SUNDAY, October 27th, for their LAST flea market of the season. We've acquired dozens of great items that will be making their first appearance on our tables and will be offering amazing deals! Get there early for the best selection and bring your folding money! We will have quite a number of new items to share with you, and will start posting "sneak previews" on our Facebook page next Monday, September 23rd, so be sure to "like" us! And come November, we'll be back selling on eBay, so bookmark our page and get ready to do your holiday shopping with us! Our thanks for making our first year so successful!! We had a great time helping the folks unload decades of goodies at their yard sale, and are now looking forward to this Sunday, September 8th, when we will once again be setting up at the Hollis Flea Market. We will have literally hundreds of new items available, including an extensive selection of tools (including a few power tools), and some great antiques culled from their collection. The weather is once again supposed to be just perfect, so we hope you'll join us this Sunday! BIG Yard Sale in Monroe, CT this Friday and Saturday! If you live in Southwestern Connecticut, be sure to check out the BIG MOVING SALE happening Friday and Saturday from 9a-4p at 260 Wheeler Road in Monroe. The folks are moving and downsizing after 40+ years in the same home and will be offering tools, furniture, collectables, and too much more stuff to list! Click HERE for all the info! We'll be back in Hollis next Sunday August 18th! Come see us Sunday, August 18th, as we return to the Hollis Flea Market starting at 6am! This will be our last flea market appearance until the last weekend of September - hope to see you there! This Sunday, Find Us At The Hollis Flea Market! We'll be bringing this pair of beautiful midcentury Syroco Wood Wall Sconces, along with tons of other great items, to the Hollis Flea Market this Sunday, August 4th. We plan to be there by 6am, and encourage you to get there early for the best selection. We'll be asking just $20 for this classic pair - they won't last long! We've got a few pieces of Royal Worcester porcelain from the Evesham pattern available right now. They're all in excellent to near mint condition, and include lots featuring a sugar bowl and lid, a covered casserole, and a 24 oz jug. We've got several other pieces from this pattern available, including a coffee pot, so if there is a specific item you are looking for, let us know via email at LovequistAntiques (at) outlook.com! This 2.25 QT Deep Oval Covered Casserole has SOLD! This 4 Cup Teapot has SOLD! Sneak Peek Week has returned to our Facebook page! Every day this week, check out Facebook for an exclusive picture of another new item we'll be bringing to this Sunday's Hollis Flea Market. We're going to have a lot of fresh new inventory up for grabs, and it all starts at 6am, so get there early! 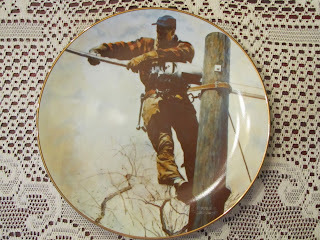 Spent the mornings of both Tuesday and Friday picking the fields of the Brimfield Antique Shows with great results! We'll have all sorts of intriguing new items to share with you next Sunday, July 21st, when we return to the Hollis Flea Market. Check out our Facebook page starting this Monday for a few more "sneak peeks" at what we'll be offering! The Hollis Flea Market was a winner! We had a great day setting up at the Hollis Flea Market in Hollis, NH today! The crowds came early and were wearing their buying shoes, and the weather was a little less hot and humid than had been expected, putting everyone in a good mood. We expect to be back in Hollis on Sunday July 21st! This site has just reached the magic ONE THOUSAND HIT mark! Our thanks to our friends and customers for their support! We'll be back selling at the Hollis Flea Market over the holiday weekend on Sunday, July 7th and look forward to seeing you then! We just SOLD this cool Cooper Potbelly Stove Thermometer on eBay. It's a vintage beauty from the 1960's and is in great shape! Check out all of our current eBay listings HERE! Here's wishing everyone a great weekend! We've got a couple of items up for grabs on eBay right now, and should be listing several more very soon. Our next flea market appearance will likely be on the weekend of July 6th and 7th - we're not quite sure where yet, so stay tuned! Here's another great advertising sign that is only available here on our website. This two sided sign for the Carte Blanche credit card is made of steel and is most likely from the 1960's. It measures 24 inches wide by 20 inches high, and is in good condition for something that was meant to be displayed outdoors. We're asking $60 for this great sign, and that includes shipping in the USA via USPS. Contact us at LovequistAntiques (at) outlook.com if you are interested! We recently SOLD this terrific MINT CONDITION Tirschenreuth Bavarian Porcelain Demitasse set on eBay. This gorgeous unused set features a gold and cobalt blue design and was in its original box. LONDONDERRY THIS Saturday and Sunday, June 1st and 2nd! We will be set up at the Londonderry Flea Market this Saturday and Sunday! You can find us on the lower field (the left side of the property), in the third row, all the way on the left-hand side, in the shade under the trees, from 8am until 3pm both days. Admission is only a buck, and Senior Citizens get in for FREE. Be sure you check out the "sneak peeks" we've posted on Facebook! Well, it looks like the weather is going to prevent us from setting up at the Londonderry Flea Market this Saturday and Sunday, as we had planned. We may decide to do Londonderry both days NEXT weekend, or we may just be at the Natick Flea Market on Sunday, June 2nd - be sure to check back here, or on our Facebook page (where we are also giving you "sneak peeks" of some of the items we'll be offering), for the very latest! It's Sneak Peek Week on Facebook! All week long on our Facebook page, we'll be previewing several of the great new items we'll be bringing to the flea markets over the next two weeks, and also giving you the chance to "reserve" them! So be sure to "like" us on Facebook, and our thanks if you already have! We just sold this 100-year-old tin litho Calling Card tray, or Tip Tray, featuring champion hunting dog Champion Tony's Gale, on eBay! These tin trays were used as promotional items back in the early part of the 20th century, and feature scalloped edges and crimped fan corners. Click HERE to see all of our current eBay listings! Recently sold on Ebay - two beautiful Fenton Glass Top Hat toothpick holders from the 1960's. We have several other colors available as well - if there is a certain one you are looking for, drop us a line at LovequistAntiques (at) outlook.com and let us know! Here's another great piece perfect for a bar, man-cave, or smoking room. It's a wood humidor / smoking stand with a beautiful copper lining. This antique stands about 25 inches high, 11 1/2 inches wide, and about 10 1/2 inches deep. The humidor section itself is about 8 inches high, and contains a copper lining, which is in terrific condition. I'm not sure how old it is, but judging by the lovely metal pull on the door, the original hinges, and the excellent quality of its construction, it's certainly from the first half of the 20th century. We are asking just $60 for this vintage piece. It is available for local pickup from our location in Billerica, or could be delivered to an address between Burlington, MA and Nashua, NH for no additional charge. We accept PayPal in advance, or cash and good checks upon delivery. If you would like it, or have any questions, drop us an email at LovequistAntiques (at) outlook.com and we'll get back to you as soon as we can! We've got quite a number of cool Art Deco-era Door Plates available ONLY here on our website! Each antique sign is made of embossed steel coated with black and white enamel. They all date from roughly the 1930's, but are considered New Old Stock, as they do not seem to have ever been used; a couple of them even remain wrapped in their original wax paper. They all measure 10 1/2 inches long by 2 1/2 inches high and have two screw holes for hanging. You will be getting the exact signs pictured so please inspect them closely. All prices INCLUDE shipping! Contact us at LovequistAntiques (at) outlook.com if you'd like one (or more)! LADIES ONLY - still in wax paper - looks MINT - SOLD! The MEMBERS ONLY with the white back is the only sign in this lot that is not perfectly flat. PUSH and PULL - just $52 gets you BOTH! Waterford Millennium Crystal - SOLD! JUST SOLD on eBay - this great set of two Waterford Millennium Crystal glasses in the sought-after Universal Wishes pattern, to a customer who is just THRILLED to have gotten them! I love it! We offered a great assortment of Vintage Straight Razors on eBay, and they have all SOLD! Come see us THIS SATURDAY at the Londonderry Flea Market! The weather forecast for this weekend looks SUPERB, and so we are going to be setting up at the Londonderry Flea Market in Londonderry, New Hampshire, this Saturday, April 27th! We'll be offering all sorts of fantastic items, from crystal, cut glass, pink Depression Glass, and blue Capri glass, to old advertising signs, posters and prints, TONS of silverplate at GREAT prices, vases, autographed items, some furniture, and lots more! We WILL be set up on the LEFT side of the field (the Lower field), which is the side closest to the power lines. The Londonderry Flea Market is open from 8am to 3pm, charges just a buck a head for admission, and is FREE for senior citizens. Get there early if you can, as we arrived last week (as customers) right when the market opened at 8am and folks were literally RUNNING to their favorite dealers to get the best stuff before it sold to someone else! They also have several food vendors and a small pond with picnic tables in the middle of the field. It's going to be a terrific day, and we hope to see you there! This GIANT Conoco sign would look GREAT in your garage or shop! Here's a statement piece that will really add that "WOW" factor to your garage or shop! This great old embossed CONOCO sign is made of Lexan, making it very durable, and is HUGE, measuring 94 inches long (that's nearly 8 feet!) by 29 inches high. It was most likely originally part of a two-sided lighted sign that would have been used at a CONOCO gas station. It has a few nicks and scratches, but no significant defects, no cracks, and the color is still strong - check it out for yourself! We are asking only $100 for this magnificent piece of petroliana! Due to its size, this rare find is only available for local delivery or pickup in the Lowell, Ma area. You can pick it up for free from our location in Billerica, or I can deliver to addresses between Burlington, MA and Nashua, NH (and up to 10 miles from Lowell) for no additional charge. I will also deliver to addresses up to 25 miles away (Boston, Waltham, Salem NH) for an extra $25. Please contact us via email at LovequistAntiques (at) outlook (dot) com if you want it!